Home > Sporting Group > German Wirehaired Pointer "Rene"
German Wirehaired Pointer. A Limited Edition Print created from the original Acrylic Painting. Image size is 11"x14" and it is signed and serially numbered by the artist. 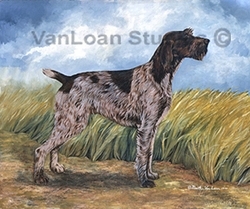 Double Mats and Studios Frames are available for this print with a finish size of 16"x20".